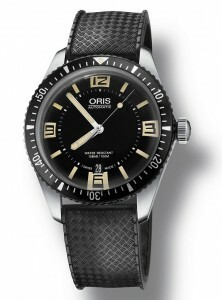 Reissue design of the original Oris 1960s Divers model, this retro vintage look model looks great. It is a 40mm stainless steel case, screw down crown, with date indicator, stainless steel case back, and automatic movement. Available on rubber strap with traditional pin buckle.